It won’t be long before the Easter bunny makes an appearance and the kids are getting excited for fun-filled Easter baskets and the long-awaited egg hunt. Beyond the fun of the egg hunt, the kids are always excited for the cute Easter goodies to satisfy their sweet tooth. 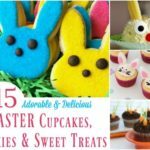 Browse through these 115 Adorable & Delicious Easter Cupcakes, Cookies & Sweet Treats! I’m sure you will find a few to add to your Easter celebration! You won’t be able to resist!